Description: Contains over 95,000 center-column cross-references to enrich your reading. Its Smyth sewn binding adds durability for frequent use and travel. Calfskin edition: Superior Quality, hand-crafted, lined-to-the-edge style calfskin cover. I have used this Bible for over a year now and it is simply the best! The font is large but not too large. The paper is sublime … very little bleed through/ghosting. 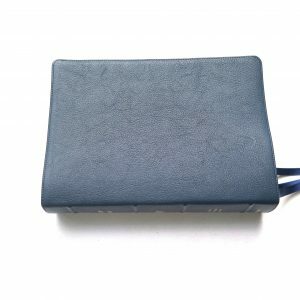 The calfskin cover is very soft and gets better and better with use. The Bible really opens up nicely after a little use and is very flat. Beautiful, highly usable, and durable. And at $94 this is a steal! Its definitely worth the full retail price of $149. I purchased the Lockman NASB Large Print Ultrathin (Black Calfskin) in June 2010. I really like it. THe leather is sublime! The stiching is great, so far. The Bible opens flat. Gets better with age. I use it every day, but keep it stored in the cover that comes with the Bible. I priced the Cambridge (too much $). I contacted RL Allan, but their NASB won’t be released until late 2010 – and it will have side references, not center column. smooth feal & very crisp clear text, nice slip case ,excellent price point, quality binding great NASB for everday use!!! I bought this Bible about a year ago from Lockman. Mine is a damaged unit that I bought on clearance so any defects from that I will not mention for this review. 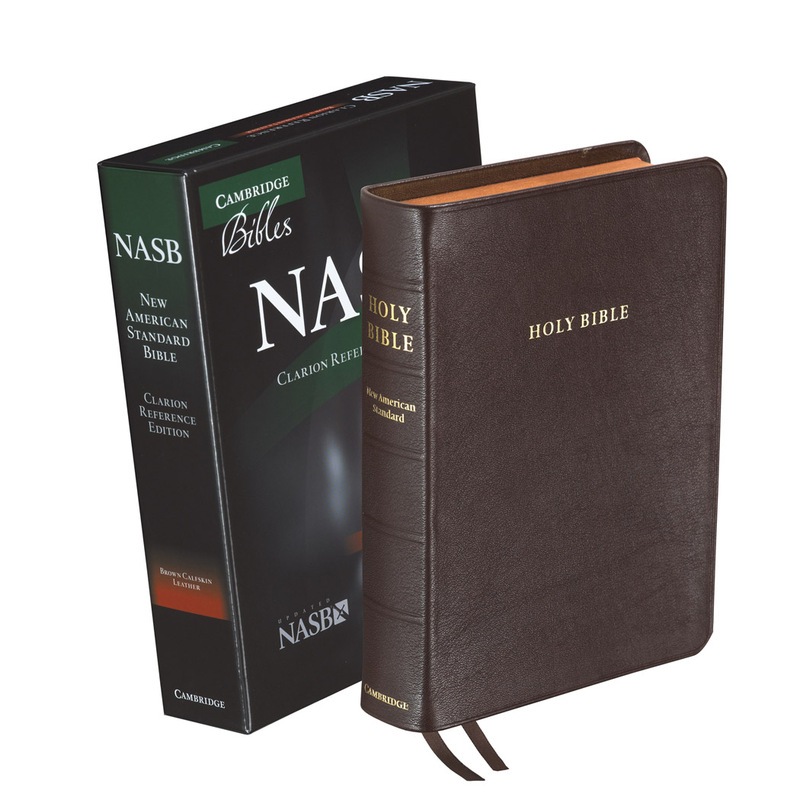 This is simply the nicest NASB Bible available from Lockman. The calfskin is soft and supple. The bible opens flat and gets more flexible with use. The paper is, without a doubt, the best there is in a bible of this type. It beats any and all Allen Bibles hands down. It is very white and the text is extreemly clear. You have to look very hard to find any ghosting from the pages underneath. There is nothing subjective about the ghosting/bleedthrough of this Bible. It is one of the best. If you’re looking for a good NASB then this one is definately worth your consideration. For something in the $100 price range you simply cannot find much better. This is an absolutely great bible!!! Very easy to read and an excellent binding. Almost in the same league as my goatskin bibles from Allen and Cambridge. The price makes this bible a great bargain! FOLLOW-UP Comments: I continue to be amazed at the bargain this bible represents at this price-point!!! 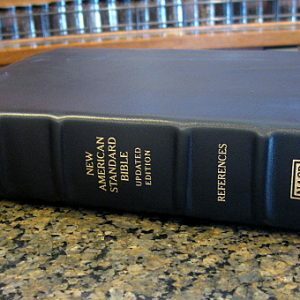 !I love the supremely flexible binding……..I LITERALLY HAVE TO USE BOTH HANDS TO LIFT THE BIBLE OFF MY DESK….VERY LIQUID!! !…..and, the hand-feel when balancing the bible in one hand while reading is just great!!!…..WOW! !…..This bible is worth much more than its current selling price!!!! Just purchased my second edition of this Bible……….My sister-in-law ACCIDENTALLY packed my first edition of this Bible in her luggage during her last visit!!! She said she\’d never seen such a beautiful Bible!!! I\’ve had this Bible for a couple of months and it is rapidly becoming my Bible of choice. It is larger than what I usually like to \”carry\” but the craftsmanship, leather, font, clarity, paper…all top-shelf in my opinion. There was a problem with page separation at first but Lockman replaced the Bible after I sent them photos of the problem. They advised to just keep the \”old one\” and perhaps donate it to a worthy cause. I found their customer service to be outstanding! I highly recommend this edition to anyone…truly worth the price! This is one of the most beautiful Bibles I’ve ever owned! The leather, paper, and printing are top notch. Thank you Lockman, for giving the opportunity to read God’s Word in such a beautiful, and affordable way. This Bible beats R.L Allan in readability by a mile- in my opinion. Buy it!! I’ve only had this bible a couple of days but I am really impressed with it for the amount spent. The leather is nice and supple and the print is very readable for these old eyes of mine with what seems to me to be minimal bleed-through. Would like for it to have had at least one more ribbon but this is not a knock. All in all a very nice bible and in my humble opinion, a very good value. Will give the text block a 5 rating. The leather cover finish a 2 star rating. I wanted it for the large print but Foundation publishing has lost it’s glamour with me. The inside cover is about 5/16 inch short on the text block top and bottom on both sides of the Bible. My old one from years ago was perfect. Just don’t buy it for the soft leather cover. The leather is probably ashamed it got cobbled up this way. Lockman spoiled me and now they almost make me angry at the sloppiness of the worksmanship on the cover. Buy one for less if you are just reading the text. Recently switched to NASB from ESV. Everything about this bible I am satisfied. I am extremely picky about my bible, almost to the point of OCD, but this is just awesome. In the short time I’ve had this Bible, I’ve really enjoyed it. The leather is extremely soft, lays flat and feels nice to the touch. I have always enjoyed the NASB and believe it to be one of the most accurate translations at this present time. The type is very crisp and easy to read. this Bible is already falling apart at the binding, very cheaply made and not worth more then $30.00 in my opinion. I have already highlighted several verses so sending it back is not an option, it actually fell apart after the highlighting. I would never recommend this product or this company to any customer…. but, I know there is always a, but after the review starts the way this one did. The, but in this case is the hit and miss nature of some of the Chinese manufacture processes. This would have been a great Bible if fit and finish quality of the work were better. 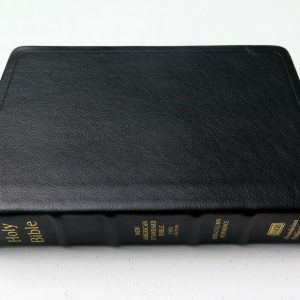 This is $100.00 Bible and should reflect that in the finished quality. Their was a section in the back where the overly thick card paper edge was glued improperly so that the white paper edge was visible and exposed. also on the front of the Bible the card paper was splitting on the bottom corner. I dont know if it was not glued well, bent during shipping from China, or the card paper that was used was just to thick and rigid for this application. 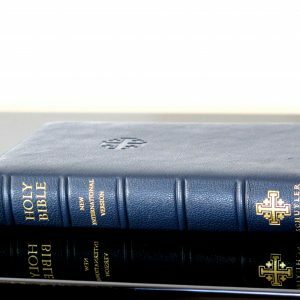 The Head and foot areas of the Bible could do with more precise attention to quality. The notches could be smaller. The ribbon markers could be a thicker, higher grade of ribbon. Lockman needs to move away from using the higher clay content shiny paper for the presentation pages and maps and move to a flat paper. The glossy ones are too prone to falling out. The presentation page should have been a couple of pages in so that you could actually write on it. It is glued to the card paper that attaches to the binding and cover. 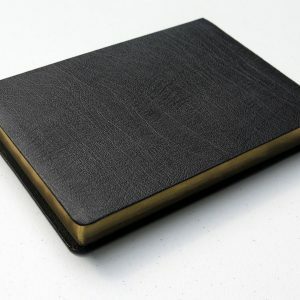 I think if Lockman Foundation left the manufacture of their Bibles that cost less than $50.00 in China it would be alright, but with their middle and top end products they really need to bring it back home. They sent me a copy of the hardcover Charles Stanley text Bible that is made here in America and it was excellent. I loved the paper and the binding. If this Bible got the same treatment it would be worth the $100.00 price tag, but as it is I would have to pass. They did send this Bible to me for free to be reviewed on my blog. 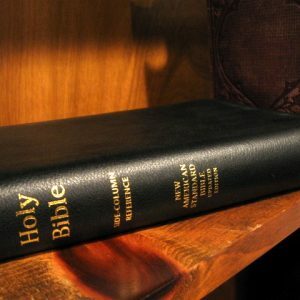 With all the cons, I dont want you to get the idea that this Bible does nothing right. It has a sewn binding, and a calfskin cover. 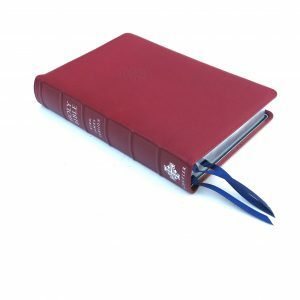 It includes two ribbon markers and it is pretty thin considering that it is a real reference Bible. 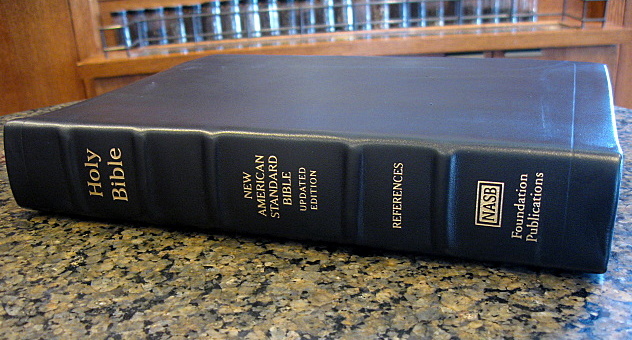 You get all the benefits of a full reference Bible with a pretty thin profile. The Side Column Reference Bible I did a review on previously had more attention paid to fit and finish. It was better so I overlooked some of the smaller cons like the opaqueness, excessively notched near the head and foot, and ribbon quality. The opaqueness isnt near as bad as other Bibles Ive seen. I just mention it because it isnt as good as some in the same price range. It seems like a more flexible card paper was used to connect the cover and text block on the side column reference which I love. This one con seems to cause others or make them more noticeable. 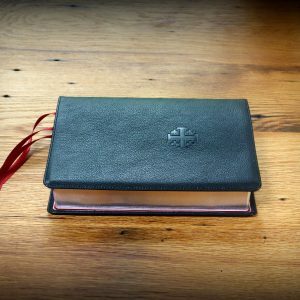 It is difficult to design the perfect Bible because, well it is subjective. 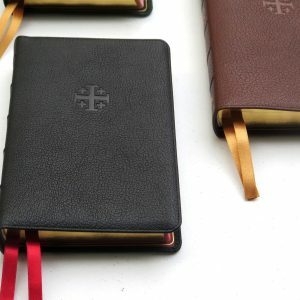 We like what we like though, so you can either make a ton of variations and try to please a lot of people, or you can make a few, really well made Bibles and hopefully sell a bunch of them to a smaller crowd. The bottom line is that you still get a great translation, in a sewn binding that is very flexible and lays flat, with genuine calfskin cover. I would just suggest they make these here in America or lower the price. Features, Ultrathin, large print 10 point font, making it easy on the eyes, double column verse format with center column references, Black letter edition, 8 pages of full color maps, Concordance, 2 Ribbon markers, gilt page edges, Presentation page, Family record pages, Gilded edges, Smyth Sewn, Printed on high-opacity paper to limit bleed-through, Lifetime guarantee, Black Calfskin leather. I received mine a few days ago. I paid $100.00 for the Holman KJV before it went out of print and that one was quite a bit nicer. This is a good bible, but it is kind of stiff and the paper isn’t all that great. Don’t get me wrong, it’s not awful. 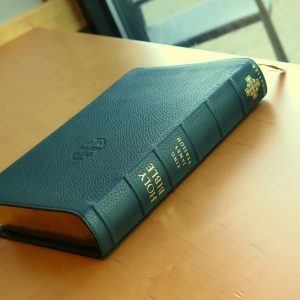 It’s certainly better than you will find on the shelf at a bookstore, and I do like it and will read it daily, but if you’re looking for a jaw droppingly well made bible, keep looking. I’m only going to add that the paper is bright white with a blue hue. And while this bible isn’t really a thinline, it’s not that thick. It’s thinner that the SCR bible, but a wee bit thicker than, as, the ESV thinlines. Great bible. just received a 2nd Bible and I am once again very disappointed in the quality and workmanship of this Bible bind is falling apart…its glued not sewn and the ghosting is horrible I wasted 116 on this Bible…needless to say I wont again.. 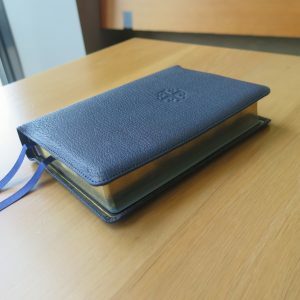 I waited almost a year for this to be released….I wanted it because it seemed to be the closest thing to the Charles Stanley calfskin bible that was discontinued. After getting this one, I saw a new Charles Stanley “authentic – made in USA” calfskin bible on ebay and bought it. It’s unbelievable, heirloom quality! However, it’s so rare that I don’t want to mark it up. So I use the Chinese knock off version listed here. No regrets, this is an awesome bible for the money. Use it daily and it is really nice! You can’t buy a better bible at this price.. This is a great bible. I bought two just to have an extra, it’s so nice!!! Bought this for seminary. Was looking specifically for a verse-by-verse version to make it easier for reference as I use it to study and write. Leather is soft, Bible lays flat, paper is good, and text is legible. I’m not giving it a 4 star, because I’m unhappy with it, but because I consider Allan, Cambridge, Schuyler, and Crossway Heirlooms to be 5 star and this Bible isn’t as nice as those. That being said, you’re also paying $100 bucks less, so it’s a good value. This is a great Bible for study, reference, preaching, and teaching.